Several constitutional challenges to the law have rather quickly (in terms of the Supreme Court anyway) made it to the very top of the legal chain. Supporters and those opposed to the new law both want to see a quick decision by the Court on the most controversial components of the law – specifically, the “individual Mandate” that requires people not receiving health insurance benefit opportunities from their workplace, or through government programs like Medicare, Medicaid, or Tricare, to purchase health insurance through an exchange with help from government subsidies. Those who do not purchase insurance that meets a minimum standard of coverage would pay a penalty to the Federal Government. the private market is opened up to people with chronic and congenital conditions that otherwise would be denied, while the mandate ensures that younger and healthier people also participate in the market so that risk is spread, and premiums can be kept low. The Federal Tax Subsidies to new purchasers help to offset the costs to individuals and families that are new to the market. The twenty six states bringing suit believe that the federal government can not force an individual to buy insurance through the threat of a fine. This section of the Constitution is the basis for many of the powers granted to the federal government over the states, and the limits of the commerce clause are the foundation of powers declared by, or given back to the states from the Federal Government. Many of the most important questions put before the Supreme Court are cases of the nature of Federal versus State power, so the Commerce Clause is one of the most hotly debated parts of the American Constitution. The Obama Administration argues that the Individual Mandate is part of the broad powers given to the Federal Government to “tax” individuals in order to regulate interstate commerce. The states involved in the suit, and conservatives opposed to the Reforms argue that this amounts to the Federal Government requiring individuals, under penalty of law, to purchase a product whether they want to or not – an intrusion on both individual and State freedom. Can the Supreme Court rule on the law before the fine has ever been imposed? If the Individual Mandate is not upheld, does it invalidate the rest of the law? Can the federal government force the states to expand their Medicaid programs, even if the federal government pays for the state program expansion? 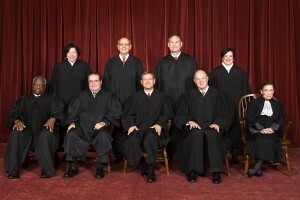 Of the nine Justices on the Supreme Court, five were appointed by Republican Presidents and four were appointed by Democrats, including two appointed by Obama. The four democratic appointees – Ginsburg, Breyer, Sotomayor and Kagan- are presumed to vote to uphold the bill, while Clarence Thomas, one of the five Republican appointed justices is presumed to vote to repeal. The other four justices: Scalia, Thomas, Roberts, and Alito are considered to be “swing votes”. With mixed or limited records on Commerce Clause cases and Federal Power, many Court observers widely believe that their votes will be the deciding factors. A decision will be handed down by the Supreme Court in late June. What does this mean for medical practices as small businesses with more than 50 employees? If the PPACA is upheld, and the practice does not offer medical insurance benefits to its employees and your employees receive income tax credits for purchasing health insurance through a state exchange, you will be required to pay a fee of up to $2,000 per FTE for every employee after the first 30. Currently, practices with 25 or less employees with an average wage of up to $50K annual wages can get a tax credit of up to 35% of the cost of health insurance premiums. What does this mean to medical practices of all sizes? If the PPACA is upheld, in 2014 our world will change. In 2014, we would expect to see patients moving away from the ER as a source of primary care and into practices, and there would literally be no more “Self-Pay” patients in traditional private practices! This will expand the complexity of pre-visit eligibility and claims filing and patients will continue to be confused over benefits, but that is what insurance is all about. What are your concerns for your practice or business if the PPACA is or is not upheld? I just wanted to say this a very well written, unbiased article that presents the facts and lets the reader form their own opinion. So many writers today want to spin the facts leaving the reader unsure of what is fact and what is not. Kudos to the writer! Thanks for the feedback. Abraham Whaley is our political writer – he follows healthcare politics closely and has a passion for writing about it. Nicely done! It’s amazing that too many folks do not understand how this will really have an impact on them if their health should fail. All we can do is sit and hope for the best outcome.